In November 1849, Cambridge, Massachusetts, was very much a sleepy town run by Harvard University. While Cambridge is no longer “sleepy,” Harvard still controls the economy, life, and politics of that New England city. Not much has changed. However, reading Paul Collins’ excellent Blood & Ivy does serve as a reminder that American attitudes have changed quite a bit since the 19th century. In 1849, when Harvard chemistry professor Dr. John W. Webster was accused of murdering a fellow professor, many Boston Brahmins and their peers all across the United States felt that it was impossible that a well-educated man with the right breeding would ever stoop to murder. The problem was that Webster was the murderer, and the Commonwealth of Massachusetts ultimately hanged him for it in 1850. Blood & Ivy tells the full tale of the Parkman-Webster case. In sum, Webster, a spendthrift who borrowed money excessively in order to keep up appearances, either coldly murdered Dr. Francis Parkman, his biggest creditor and a professor of medicine at Harvard, or lethally struck him during a fit of rage. Either way, Webster was certainly guilty of cutting up Parkman’s body and burning it in his office’s furnace. If not for the intuition of a humble Harvard janitor, Webster almost certainly could have gotten away with the horrid crime. Blood & Ivy is not so much about mystery, and it is far from a whodunit. After all, Webster is outed as the culprit by page 81. Rather, Collins’ book is a time capsule—a snapshot of Harvard University right before the age of railroads. This Harvard belonged to the families of Boston’s original Puritan settlers. Webster and Parkman both belonged to this class, and both men characterized the duality of Boston’s wealthy elite. Parkman was a shrewd businessman who was completely unforgiving to his tenants and to those who owed him money. Parkman was covetous, whereas Webster suffered from greed. Webster became murder-minded after years of wasting money on books, laboratory equipment, parties, and sumptuous feasts for his wife’s family—a mercantile clan with deep connections to the trade between Boston and the Azores. The real thrust of this well-written books comes during Webster’s trial. Here, the Harvard professor tried to defend himself by demeaning the character of Ephraim Littlefield, the janitor who first suspected Webster and the man responsible for finding Parkman’s bones. Webster and his defense team tried to portray Littlefield as the murderer. When that failed, they asked the jury to consider that inferiority of Littlefield when compared to Webster. That, too, failed. As Collins notes, the Parkman-Webster trial proved to be a milestone in American jurisprudence. Not only was it one of the first trials to allow dental and handwriting samples as evidence, but Judge Lemuel Shaw’s ad-hoc definition of “reasonable doubt” would serve Massachusetts and the rest of America until 2015. Also, in the bigger picture, the conviction of Dr. Webster struck a slight blow against wealth and privilege, as mostly white-collar jurors decided to believe the word of a janitor with a noted fondness for gambling over the word of a credentialed master at Harvard. 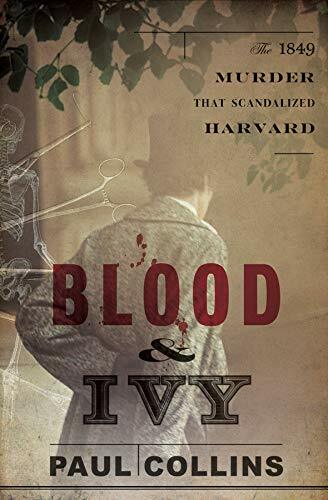 Blood and Ivy is a must read for all those interested in a gripping true crime story and American history before the Civil War.